This year the Buffalo Half Marathon course deviates from what we raced a couple of years ago to accommodate the vast amount of construction taking place in Downtown Buffalo. Previous years had runners journey out to the Outer Harbor, which is undergoing a drastic facelift along the Ohio Street Corridor. Only a little bit of construction . . .
To deal with this changing waterfront landscape, runners will instead journey up to my neck of the woods, Delaware Park and the Elmwood Village area. This route was typically part of the full marathon, and now has been expanded for those running the half as well. I honestly love the change, because I find it a lot easier to run in familiar areas. At mile three I will literally be within a stones throw of my apartment, and for the first seven miles we will be running a route we typically take on 90% of our training runs. 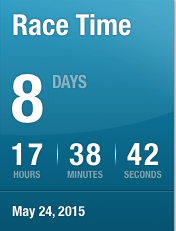 The part of the race however that I love the most is going to be miles 8 to 9, which will have us running through LaSalle Park and around the Inner Harbor. This is one of my favorite places in Buffalo, with its picturesque view of the lake, and a nice cool breeze typically cooling us down. I am very excited to have this so early on in the race. Overall, I like the changes. I think the single best part is no longer having to run over the old iron drawbridge on Ohio Street through Silo-city. That bridge felt awful on our feet 8 miles into a run.